Show business is all about constantly exciting and surprising its audience. That explains the need for casting coups. The very concept resonates an indescribable element of thrill and anticipation. To see two mega stars share the same frame is stuff every fanboy/girl dreams of. At times, it's no more than a grand gimmick aimed at generating box office frenzy. On others it's just a case of pieces falling in place. How else do you explain the charm and splendour of watching three generations of Kapoors -- Prithviraj, Raj and Randhir in Kal Aaj Aur Kal or the controversial pairing of Amitabh and Jaya Bachchan with Rekha in Silsila. Or a clash of stalwarts like Dilip Kumar and Raaj Kumar squabbling like egoistic kids in Subhash Ghai's Saudagar, Big B playing the resentful son to Dilp Kumar's duty-bound father in Shakti. Not to forget the surfeit of stars in Raj Kumar Kohli's Jaani Dushman or Manmohan Desai's unforgettable multi-starrer song, John Jani Janardhan in Naseeb. 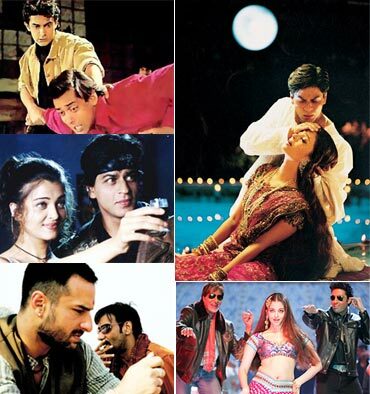 On that note, a look at a few of Bollywood's most memorable casting coups in recent times. Feel free to send in your picks as well. Don't be fooled by the low-budget aura of his laughter-by-the-second saga about two goofy tricksters caught in a web of juggling romance and foiled kidnapping. 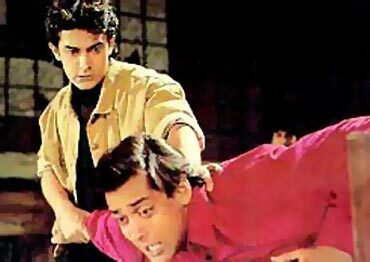 For Andaz Apna Apna, when it comes to casting, is right up there featuring the two of the top-most Khans -- Aamir and Salman -- playing the iconic Amar and Prem. In today's scenario it would be unthinkable but director Rajkumar Santoshi pulled it off. And how! The man risked it further by signing on leading ladies -- Raveena Tandon and Karisma Kapur, cutthroat rivals at that point. Despite this masterstroke casting, the film wasn't a big winner at the box office. Although over the years, AAA has attained classic status. What can be more perfect than seeing two of Bollywood's finest dancers -- Madhuri Dixit and Aishwarya Rai Bachchan -- match steps to the high-octane Dola re in Sanjay Leela Bhansali's adaptation of Sarat Chandra Chattopadhyay's literary classic. In this perfect marriage of experience and eagerness, Madhuri's restraint and Ash's verve proved to be a delightful combination and a glorious big screen moment. 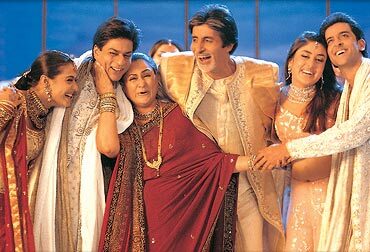 Trust filmmaker Karan Johar to bag the cream of the crop to essay three generations of Raichands for his emotional family saga, K3G. And so he roped in the weightiest surnames in the business -- Bachchans, Khans, Kapoors, Roshans -- you name it. While Amitabh and Jaya Bachchan relived their Abhimaan chemistry, Bollywood's favourite pair -- SRK and Kajol did their thing even as the new hot jodi on the block -- Hrithik Roshan and Kareena Kapoor sizzled with style and sexiness. Every star worth his salt wants to be associated with Yashraj Films. Ash and Hrithik are no different. before this they had appeared together in a couple of tame Coke commercials. No one was quite sure what to expect from this exceedingly good-looking jodi. But producer Aditya Chopra and director Sanjay Gadhvi clearly knew what they were doing when they cast the ultimate beauty and hunk to play grey characters (no less) in the second installment of the Dhoom franchise. Their explosive chemistry bolstered by a sensual lip lock branded them one of the hottest pairs in the movies. Jodhaa Akbar confirmed it. Guzaarish aims to follow suit. Despite being critically acknowledged, none of Vishal Bhardwaj's boasted of box office star presence before Omkara. But for his adaption of William Shakespeare's Othello, he picked an edgy mix of tailor-made as well as unlikely actors to slip into the unforgettable skin and psyche of Omi, Langda Tyagi, Kesu Phirangi, Dolly, Indu and Billoo Chamanbahar. Be it lining up an ensemble cast of Kareena Kapoor, Konkona Sen Sharma, Ajay Devgan, Bipasha Basu and Vivek Oberoi to portray big and small parts to convincing Saif Ali Khan into shaving off his hair to play a dark, loathsome character, Bhardwaj had us hooked at hello. Her cinema is all about pomp, show and cheek. Director Farah Khan channels the show woman in her to great success doing a perfect Manmohan Desai by inviting a whopping 31 stars to grace the title track. The catchy ditty picturised on SRK along with a sparkling mix of senior stars like Jeetendra, Dharmendra, Mithun Chakravarthy, Rekha and Shabana Azmi gamely shaking a leg with the younger ones like Sanjay Dutt, Salman Khan, Saif Ali Khan, Kajol, Tabu, Priyanka Chopra and Vidya Balan. Interestingly, the same gimmick was employed by Aditya Chopra in Rab Ne Bana Di Jodi (for the song Phir milenge chalte chalte) in a bid to pay tribute to yesteryear's classic jodis. Star kids making a combo debut is always an event in Bollywood. Especially when it involves first film families. And so when Randhir and Babita Kapoor's ravishing daughter Kareena decided to join films opposite Amitabh and Jaya Bachchan's typically tall, dark and handsome son with J P Dutta's Refugee, it had everyone's curious side up. Ditto for Rishi and Neetu's dashing beta, Ranbir making his debut opposite Anil Kapoor's gorgeous offspring, Sonam playing star-crossed lovers in Sanjay Leela Bhansali's hugely hyped, Saawariya. Now that's a dream start for any newcomer. To their credit, the quartet lived up to their talented lineage despite their respective film's failure. It sure sounds good -- Hindi cinema's numero uno teams up with the world's most beautiful woman. But wait a minute, to play her twin brother? Like it or not Mansoor Khan's loosely-inspired version of West Side Musical featured SRK and Ash play siblings with attitude. A dicey move, that. Luckily, it didn't have any impact on their future on-screen romantic aspirations. A few months later they were playing eternal lovers in Aditya Chopra's Mohabbatein followed by a super seductive item number, Ishq kamina in Shakti: The Power. Before Sarkar and Paa, Shaad Ali's con caper witnessed father-son duo of Amitabh and Abhishek Bachchan sharing screen space for the first time. Needless to say, they share a cool comfort zone and are a treat to watch. But the real joy is to see them boogie in carefree abandon around Aishwarya Rai's tantalizing moves in the chartbusting melody, Kajra re. Who knew then two years later she'd be Mrs Bachchan herself? 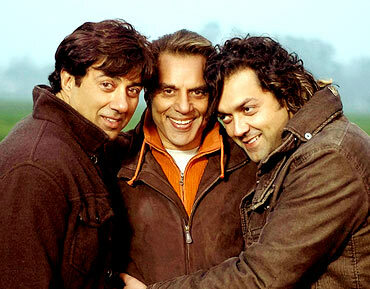 Though consciously low-profile, the Deols are one of the most loved families of Bollywood. Surprisingly, for years no one could come up with a script good enough to interest all three at the same time. And so it was only natural that fans would gather in huge numbers to finally see Dharmendra and his two puttars -- Sunny and Bobby -- in Anil Sharma's boxing melodrama, Apne. It's not every day you see Bollywood mingle with Hollywood. 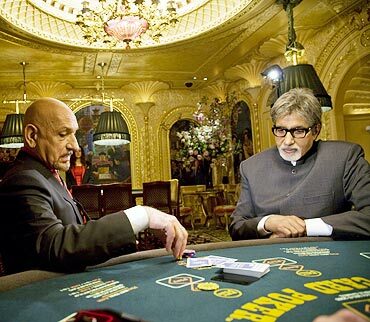 And so, one expected the world from Leena Yadav's Teen Patti, which pitched Indian superstar Amitabh Bachchan against Academy-award winner Ben Kingsley as two brainy mathematicians. Despite a curious premise and gripping performances from the two heavyweights, the thriller didn't quite attract a major audience.